A showpiece to highlight your Betta Fish, Aqueon's three tier waterfall aquarium is a relaxing and zen like addition to any room. Talk about a showpiece for your Betta Fish! Betta Falls is a calming 3 tier waterfall aquarium with three compartments with gently rolling water. With built-in filtration that cascades from tank to tank, your only task will be to sit back and admire your beautiful Betta Fish. Frosted inside panels keep your Betta Fish from seeing each and causing stress. 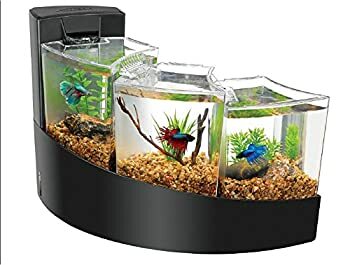 Clear front and back panels enable you to clearly see your Betta Fish. Aqueon's QuietFlow filter powers the cleanup process and waterfall feature. The easy to access cartridge filter system is tucked away and keeps your water crystal clear. A showpiece to highlight your Betta Fish, Aqueon's three-tier waterfall aquarium is a relaxing and zen-like addition to any room.